This story appeared in the Winter 2019 issue of Glimmer Train. “She thought maybe this will help. Stop in Eureka, before I get home. Maybe that will give me some ideas. Eureka! I might say. Nothing else had worked. Not getting high before the drive, which had seemed like a good idea at the time (she was probably high then too—what was she high? ), but now was beginning to wear on her. Too much exuberance. She needed to take the edge off her cheerfulness. Get sad? Slow down. Eureka. 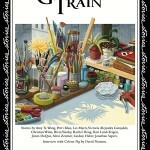 For more: the issue is available at http://www.glimmertrain.com/pages/gts_single_issues.php.